Every room deserves your very own Persona. 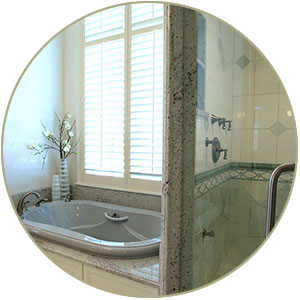 Secluded sanctuary or a seasonal showoff, let your bathroom become beautiful. 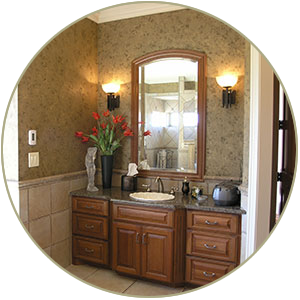 As often as they’re used and as important as they are, our bathrooms seem to get a back seat when we start thinking home remodel. But bathrooms can become more fun, fancy, functional, or all of the above. The key? A talented and skillful guide to bring out your personality and match it with your pocketbook. When it comes to Process, size doesn’t matter, as all our projects follow the Persona Process. 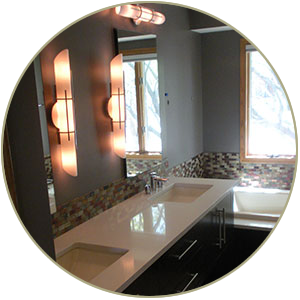 Is your bathroom dated? Carpeted? Not your style? 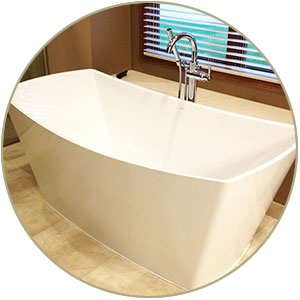 Let’s meet for your free consultation in your bathroom or (if you’re starting from scratch) our showroom. Here we will discuss your goals, wants, needs, Pinterest boards, and Houzz dreams to help us learn more about you, your lifestyle and your style. You can expect candor about function, aesthetics, and budget, as well as measurements, photos, and conceptualizing. 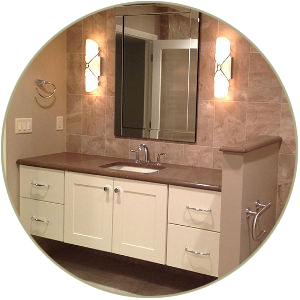 In our studio, we will present to you your custom designed bathroom created in our state of the art 20/20 software program. So you’ve seen our designs. You love them. Now, exactly which tiles are we getting? Don’t worry, we won’t leave you to sift through the hundreds of bathroom product books to pick out each little fixture. We have a trained eye and you have the final say. Together, we make a good shopping team. Your bathroom now has a solid time frame to follow. And you will have a Flow Chart to follow along with. The Flow Chart we provide you will include a timeline of your project and of who you can expect to be in your house – for what, and for how long. Ahhh. At last. No dust. No hammers. No saws. When you’re finally living in your home and not a construction zone we don’t let you skip a beat. After our construction crew marches out, we make sure no screw was left out of place. 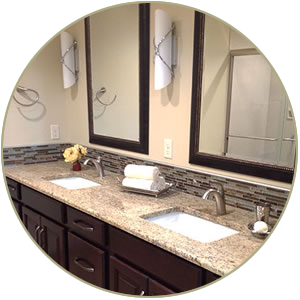 And before we say our goodbyes, our cleaning crew comes through and makes your new bathroom really sparkle and shine.